Profile: Erin was born in the greater Washington D.C. area. She holds a bachelor's degree from the University of Maryland and a master's degree from MIT, both in mechanical engineering. 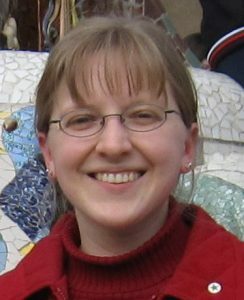 Erin learned Esperanto in 1995 and has been active with lernu.net (the Esperanto learning site sponsored by ESF) since its inception in 2002. Among other things, she has been a translator, language helper and member of the core team. In 2012, she was named director of the new subsidiary company ESF-enrete. In this role, she coordinates the day-to-day operations of ESF-enrete, which now includes lernu.net, as well as communication between ESF-enrete and ESF and between ESF-enrete and the general public. When she is not working on Esperanto projects, her hobbies include reading science fiction, listening to radio dramas, and international cooking. Profilo: Erin naskiĝis apud Vaŝingtono, Usono. Ŝi diplomiĝis kiel meĥanika inĝeniero, kun bakalaŭra diplomo de la Universitato de Maryland kaj magistra diplomo de la Masaĉuseca Instituto de Teknologio. Erin esperantiĝis en 1995, kaj aktivis ĉe la paĝaro lernu.net, retpaĝo kiu instruas Esperanton, ekde antaŭ ĝia naskiĝo en 2002. Interalie, ĉe la paĝaro ŝi estis tradukanto, lingvohelpanto, kaj membro de la kerna teamo. En 2012, Erin fariĝis la direktoro de la nova firmao ESF-enrete. En tiu rolo, ŝi kunordigas la ĉiutagan funkciadon de ESF-enrete, kiu kun inkluzivas lernu.net, inkluzive de komunikado inter ESF-enrete kaj ESF, kaj inter ESF-enrete kaj al ekstera publiko. Kiam ŝi ne laboras je Esperanto-projektoj, ŝiaj hobioj estas legado de scienc-fikcio, aŭskultado de radio-dramoj, kaj internacia kuirado.